I passed E2! ~ Journal of a dreamer. Hihi, I'm finally blogging after don't know how long. Work has ended about a week ago for me, so I have been spending much of my time watching dramas heehee. I made my way down to the school today for the ceremony. I guess I haven't been actually talking much about the lessons I have been attending for the last 2 months, but they have finally come to an end. I have passed E2 and am pretty pleased with my marks. I got full marks for my oral LOL! I think Mrs Lee was really being very kind because I'm pretty sure that my speaking skills weren't on par with hers (duh!) and I was basically blabbing my way through the part where I had to tell her what I had been doing for the past week, what I am doing this week and what I will be doing the next week. I didn't have much time to prepare for it since kau gong and family came down from Hong Kong to visit us for that 1 week, so that 1 week was basically spent showing them around Singapore and eating lots of good food lol. Anyway, to round up (since I'm pretty tired now), I'll really miss Mrs Lee. It's so sad to think that she won't be my teacher anymore because damn, she's really a very good teacher (and she's also very pretty heehee!). However, should my guess be correct, I think I'll also be looking forward to the other teacher (Bro agrees with me about the uncanny resemblance between Fierce One and that teacher). 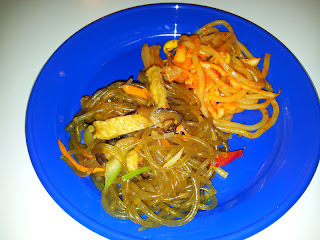 I forgot what were the red noodles called, but the japchae was absolutely one dish to die for! I swear it was so well-marinated that I even had second servings! I would have gone for more had it not been time for us to go home. The time we had for dinner was so short! D; I need to get my mum to make this and satisfy my craving! 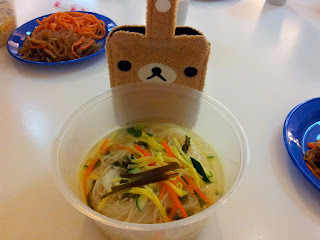 I wish I will be able to make it for Friday's dinner. I guess it's the last time I can see and talk to my beloved Mrs Lee. ;'( I'll really miss her so much hurhurhur.